If you are a cat owner, you want him or her to be healthy. Knowing what a healthy cat looks and feels like to the touch can help spot any changes that may require veterinary attention. Looking at your cat from head to toe helps establish a baseline. It is important first to point out that a "disability" such as an amputated limb, blindness, or hearing loss does not automatically rule out being overall healthy. For example, an active "tripod" cat may be much healthier than an obese cat with all four legs. A thorough check of your cat's head (and all the elements on the head) is a good practice. You'll want your cat in a relaxed state to begin your at-home exam. A healthy cat's head will give an impression of alertness. Except when sleeping, interacting with other cats, or on the prowl, the head will be carried high. 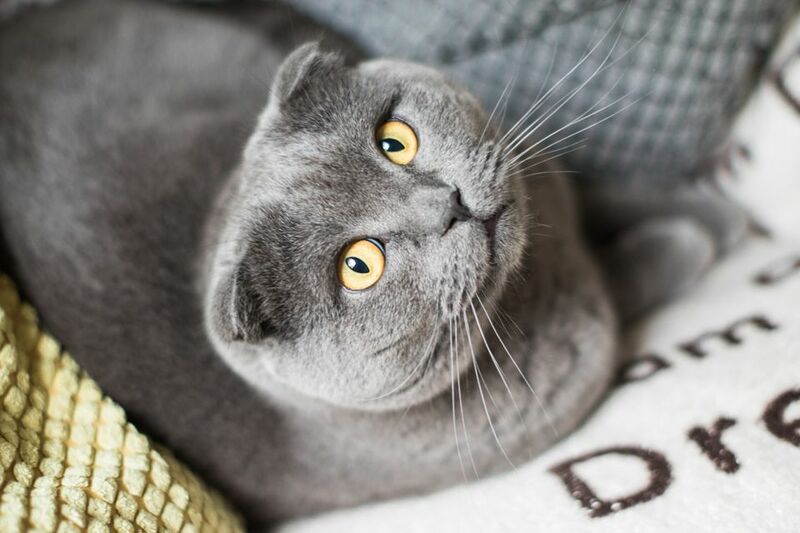 Start by knowing what all the lumps and bumps on your cat's head are in this healthy state (confirm any suspicious ones with your veterinarian). No tools are necessary, but it might be helpful to keep notes along with the date of the exam. In case you do discover something, you'll have some record of when it may have begun. Except for the Scottish fold and the American Curl, a cat's ears will be triangular in shape. The outside ear coat is very short, and, as a rule, somewhat sparser than the hair on the rest of the cat's body. Because of this, white cats and other cats with light-colored ears are susceptible to squamous cell carcinoma, a form of cancer which attacks the ear tips and pink noses of these cats. This cancer is malignant and can spread to other areas of the cat's body if not treated aggressively. Thus, any indication of sores or scabs, or a "crusty" appearance, should trigger a visit to your veterinarian. The ears should be clean, with no signs of ear mites. Although a cat's ears may normally show a small amount of wax, there should be no foul odor or visible pus or drainage, which could lead to hearing loss. A cat with healthy ears should never shake its head nor paw at its ears. Any of these signs are a red flag that the cat should be seen immediately by a veterinarian. Your cat's eyes should be clear, bright, and alert to the surroundings. Although the pupils may be narrow or wide, depending on the amount of light reflecting on them, they should always be the same size. The whites of the eyes should be white, with no evidence of yellowing or redness. Although you may see tiny blood vessels, the appearance of blood in the eye chamber is a veterinary emergency. Squinting or blinking of one eye could also indicate an injury to the eye, such as foreign matter or a scratch from another cat. These are also indications that a veterinarian should be consulted. Reddening of the pink membrane that lines the eyelid is an indication of possible conjunctivitis, which can sometimes be difficult to treat. None of these conditions are responsive to DIY home treatment. Any of them could eventually lead to serious problems and blindness if left untreated. A healthy cat's sense of smell is 14 times stronger than a human's, which is not surprising, since the cat's nose may be one of its most valuable assets. Cats depend heavily on the sense of smell to locate food in the form of prey, scent out enemies (predators, dogs, other cats), or scout for a mate. Cats use their own scent glands to mark their territory, which may range for several miles in the wild. They then use their nose with the vomeronasal organ, most often known as the Jacobson's organ, to check their own scent markings, and to ensure that no other predator or rival cat has passed that way. A cat's nose leather may be of any color, including black and pink, or even a combination of colors. The nostrils should be free of mucus, and not "runny." Although a cat may sometimes sneeze because of allergies or dust, continuous, severe sneezing, sometimes accompanied by gagging, is an indication that they may have some foreign body embedded in a nasal passage. So is a cat pawing at its ​nose? This is more common with cats allowed outdoors, who may have swallowed or inhaled a foxtail or sharp blade of grass. This is considered a veterinary emergency. Like its nose, a healthy cat's mouth and lips may be pink or black. Sometimes as cats age, their previously pink lips may develop black pigment spots, which is normal. The normal color of a healthy cat's gums and the roof of the mouth is a light pink. Very pale gums or bright pink, irritated gums, especially in tandem with other symptoms, should be checked by a veterinarian. 12 Incisors: Used for grooming, and scraping shreds of meat from the bone of its prey. 4 Canine teeth (aka "Fangs"): Used mostly for defense and killing prey. 10 Pre-molars: Used in conjunction with the molars. 4 Molars: Unlike humans, cats do not use their molars to "grind" their food. Instead, they work in a sort of "slice-and-dice" operation, somewhat like an electric meat slicer does. A cat's teeth are normally white, with small evidence, if any, of tartar buildup. They are rooted securely in the cat's jawbone. Any signs of redness in the gums around the teeth or loosening of teeth should be investigated by a veterinarian. Following a regular dental care plan will help ensure healthy teeth and gums. Although the long whiskers above the upper lips on each side of the nostrils are the ones we commonly think of as whiskers, cats also have whiskers above the eyebrows, way back on the cheeks, and shorter ones on the backs of the front legs. These extra strong hairs are called vibrissae, or tactile hairs, and they are at least twice as thick as the cat's ordinary hair, with roots that go three times deeper, surrounded by nerves and blood vessels. Vibrissae should never be trimmed, as they are a needed tool for cats. They will fall out occasionally, just as regular hairs shed, but replacements will grow back in. A cat's whiskers are so sensitive that they can feel the slightest whisper of a breeze. Their whiskers are invaluable in judging wind speed and direction, which helps both for protecting a new litter of kittens from predators and (combined with the nose) in identifying the location of potential prey. If your cat begins to balk at the exam, take a break. You'll want to be thorough, but there is no reason to cause your cat distress. Give the cat some time and then pick up where you left off. The exam can be carried out over a few hours or days, but make sure you do finish it and date your notes correctly.